Acoustic Enclosure for Excessive Generator Noise…. As the name implies, Excelon’s Limerick Generating plant required All Noise Control’s professional know how to quiet a significant noise source, a generator. Generator noise can be a health hazard to workers in the plant, can project noise to neighboring business and residential areas and overall, make plants such as this difficult to work in. This 600 acre site produces enough power to serve more than two million homes in southeastern PA, NJ and MD. 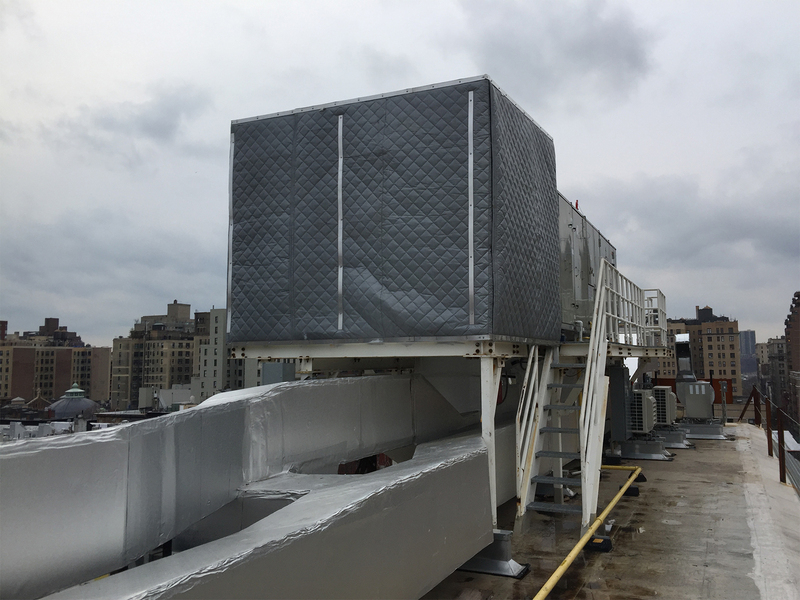 With supporting machinery and generators abound, they had a particularly noisy generator that required an industrial soundproofing solution that continued to allow easy access. All Noise Control assessed their needs through some basic fact finding discussions. The All Noise Control Acoustic Sound Curtain & Enclosure system used a variety of curtain hardware & tracks and the ANC-AB12 Acoustic Blanket. This particular blanket is comprised of 1lb non-reinforced vinyl barrier sandwiched between two 1″ quilted fiberglass acoustic blankets. The vinyl barrier acts as a dense noise barrier simply containing the noise source, which in this case is the generator. The fiberglass quilted blanket works to absorb the noise through it’s textured (open celled texture) to reduce & weaken the noise and sound waves from leaving the enclosure. The combination of noise blocking and noise absorption properties of the ANC-AB12 makes it an ideal soundproofing material for enclosures. The acoustic blanket facing withstands up to heavy abuse and heat, all constantly present in such industrial generator applications. Excelon’s specific application resulted in an 8′ x 10′ x 8′ four sided enclosure with an access opening of 4′ on the 10′ side. This indoor enclosure once installed immediately contained the generator noise. All Noise Control supplied all the necessary Curtain System Hardware and the ANC-AB12 Acoustic Blankets cut & sewn to size finished with grommets and industrial velcro so that they were able to be affixed to hardware and be tight at the overlapping seams improving it’s efficiency in containing the generator noise. As with all our customers, Excelon was pleased with the entire solution and experienced a significant drop in decibels making that area of the plant more manageable and safer for workers. We invite you to call All Noise Control at 561-964-9360 to discuss the noise control materials supplied to this particular facility and are just as happy to listen to your individual needs and supply you with a customized All Noise Control Solution. You may also visit our acoustic blanket & enclosure page or our main acoustic blanket page to see the soundproofing materials used in this application.